Chooch Enter. 9582 Random Stone Abutment Wings 4 Pcs. Chooch 9582 N Scale Random Stone Abutment Wings 4 Pcs. Chooch 9820 N Scale Concrete Stepped Wall 2 Pcs. Grand Central Gems T6 Small 3in Pines 6 Pcs. JTT Scenery 92321 Cherry Blossom Trees 3 - 3 1/2" 2 Pcs. 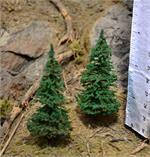 LifeLike 433-1995 HO Scale Pruned Trees 6" 3 Pcs.